The C4 WRC and Loeb maintained a 100% record on asphalt events during its WRC career, winning all 13 pure asphalt rounds of the World Rally Championship. The car made its debut at the 2007 Monte Carlo Rally in the hands of Citroën World Rally Team drivers Sébastien Loeb and Daniel Sordo. Loeb won the rally after leading throughout, with Sordo finishing as runner-up, with the pair winning the first nine of 15 stages. Loeb went on to win seven of the remaining 15 rallies that season to beat Ford's Marcus Grönholm to the title by nine points. Sordo finished fourth in the standings. Citroën retained Loeb and Sordo in their team for 2008, with Loeb winning 11 out of 15 rallies to take the title, while Sordo finished third in the standings. This was enough for Citroën to regain the manufacturers' crown. C4 WRCs were also run by privateer squad PH-Sport for Conrad Rautenbach and Urmo Aava during the season, as well as for Junior World Rally Championship winner Sébastien Ogier at the final event of the season, Rally GB. Ogier lead the event early on despite it being his first in a WRC car. In 2009, Loeb and Sordo once again drove for the factory squad, with Loeb winning the first five events of the year and then winning the final two to beat Ford driver Mikko Hirvonen to the title by just one point. Sordo finished a solid third as Citroën retained the manufacturers' title. PH-Sport ran a second team of C4 WRCs under the Citroën Junior Team banner for Rautenbach and Ogier, with Evgeny Novikov, Chris Atkinson and Aaron Burkart also appearing under the banner during the year. Petter Solberg ran an old Xsara WRC for his own team for most of the season, before switching to a C4 WRC for the penultimate round, and was then entered under the Junior Team banner for the final round of the season. Loeb and Sordo continued with the factory team into 2010, while the Junior Team ran Ogier and Kimi Räikkönen. Ogier, though, had a strong start to the season (including a win in Portugal) and so was swapped with Sordo for gravel rounds in the second half of the season. Ogier then won the 2010 Rally Japan as a factory driver. Petter Solberg drove a C4 WRC for his own team and picked up eight podiums over the season, finishing third in the final standings, behind of work's drivers Ogier and Sordo. Citroën C4 WRC at the 2006 Paris Motor Show. Sébastien Loeb at 2007 Rally Catalunya. Urmo Aava at 2008 Rallye de France. Sordo at 2008 Rally Catalunya. Loeb at 2009 Rally Cyprus. Sébastien Ogier at 2009 Rally Australia. Petter Solberg at 2010 Rally Bulgaria. Kimi Räikkönen at 2010 Rally Bulgaria. 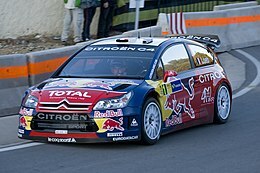 Wikimedia Commons has media related to Citroën C4 WRC. ^ David, Evans (25 October 2010). "Loeb praises C4's asphalt record". autosport.com. Haymarket Publications. Retrieved 1 November 2010.